The beauty of what we can now call the Sharknado franchise is how it holds up a funhouse mirror to our society. It shows us a parallel universe in which Ian Ziering is a famous shark killer and almost everyone makes the worst possible choice in every situation. 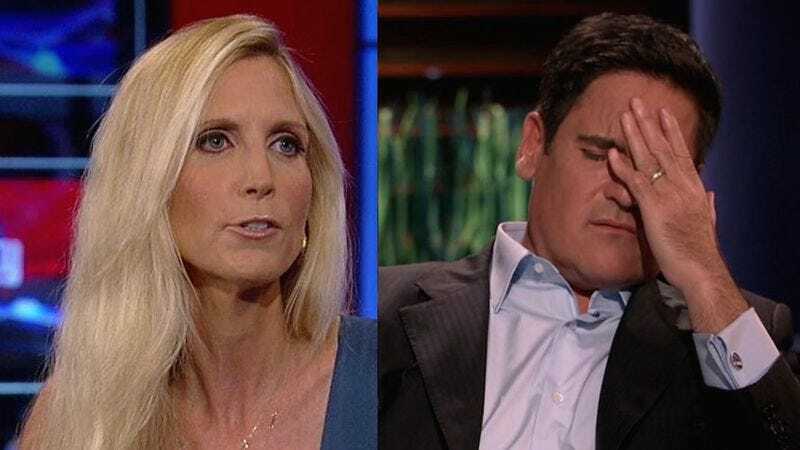 Given that commitment to creating a world where the stupidest decision is always made, it makes sense that supercilious assholes Mark Cuban and Ann Coulter will play the President and Vice President of the United States in Syfy’s upcoming Sharknado 3. We already know that the film is going to launch a bunch of poorly rendered CGI sharks into the air of Washington D.C. and down the East Coast, so it‘s really just a matter of which glib and winking celebrity faces are going to make up the new cast. In addition to cameos by Jerry Springer and Bo Derek, Cuban seems like a natural fit for the film, since he already stars in a show called Shark Tank. Yet it’s odd the movie failed to capitalize on his pre-existing ability to play a shark, given his obvious predilection for doing whatever he wants and causing rational people to run the other way whenever they see him. Ann Coulter as the Vice President makes a bit more sense, what with already being an empty vessel with no actual authority or reason for existing, though again, it seems like a wasted opportunity to not utilize her inborn preference for preying on the weak. Instead, Syfy should cast her as Vice President of Sharks; it would be both a nice bit of typecasting and help ease us into the inevitable transition to talking sharks that this franchise so clearly needs. That way, by the time Sharknado: The Sixth One rolls out, we can dispense with the humans altogether, and just have a bunch of sharks hanging out and gossiping about Tara Reid.